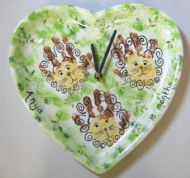 You can make a personalised clock, from any flat item in our pottery range. 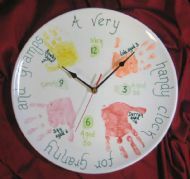 Children's hand and finger print designs are great for helping them learn to tell the time! 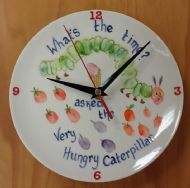 We start with a plate, or any flat item of pottery from our range. We drill a hole in the middle, and you then decorate it with your own design (or ask us to do it for you). We can help you capture children's finger or hand prints, and transform them into funky designs; maybe based on a favourite character as in some of the examples below. 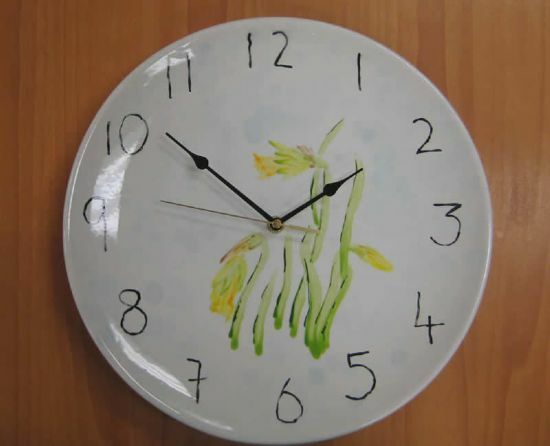 We glaze & fire the pottery piece, fit the clock mechanism (including your choice from a range of styles of hands), and there you go - a unique, personalised clock! They make great gifts, and are a real talking point. 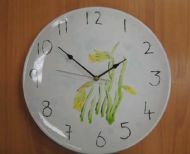 Helen painted the daffodil design on this clock herself, to make a gorgeous present for her Mum. Twins Nick & Gareth put their kids' handprints, and their own thumbprints, onto this clock as a special gift to their parents. A very handy clock indeed!! 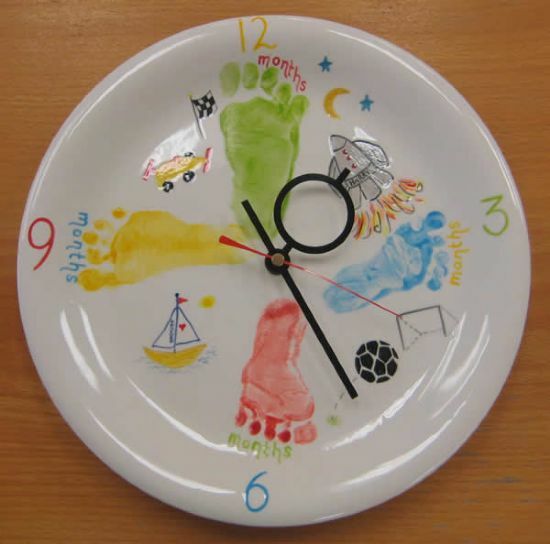 A very popular clock design is to capture a baby's footprints and 3, 6, 9 & 12 months; and thereby chart his or her first year of growth. 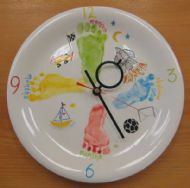 A fabulous keepsake for them to have in later life! 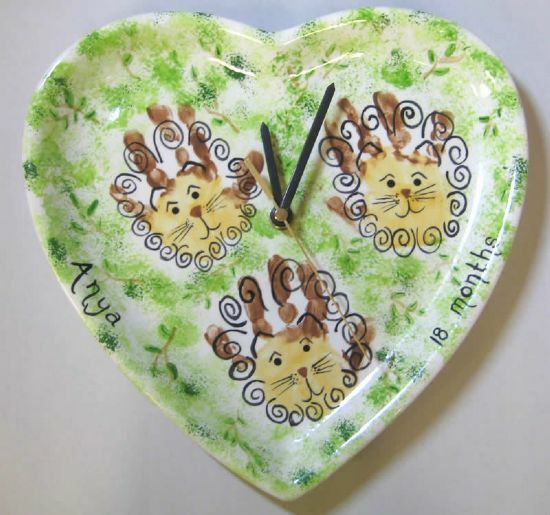 Anya's handprints made a beautiful family of lions on this heart-shaped clock. A real "pride" to be proud of! The Very Hungry Caterpillar, made from fingerprints, helps little ones learn to tell the time! 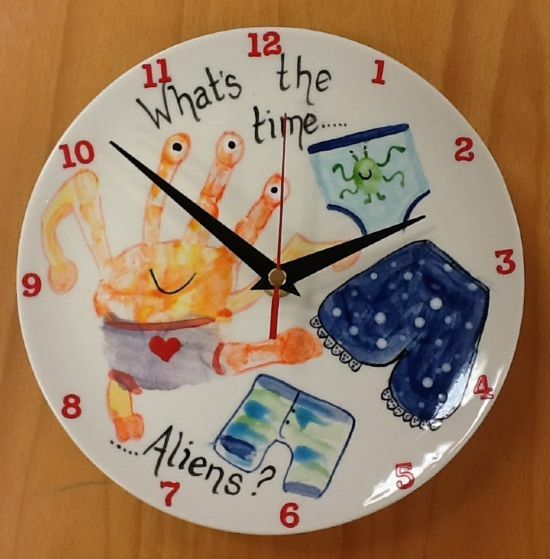 Or perhaps Aliens In Underpants are your little one's favourite? 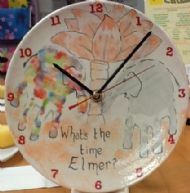 The story of Elmer the Elephant tells us how great it is to be unique. On this clock, Elmer made from handprints tells us the time!